When was the last time you met a rude driver on the road? If you have been driving in Houston lately then the chances are that it wasn’t too long ago.The Texan city is the new leader when it comes to the city with the least polite drivers in the US. The research to back this up was carried out by AutoVantage for the new Driver’s Seat Road Rage Survey and makes for interesting reading.The final position of each of the cities is based on the road etiquette seen in the place and on the amount of instances of aggressive behaviour there. It was carried out by asking 2,500 regular drivers in 25 the US’s biggest cities to tell tales on other drivers who tailgate, cut up others, speed, run red lights or simply act like naughty boys and girls behind the wheel. Cheery Waves or People Flipping the Bird All Day Long? After Houston at the top of the rude list came Atlanta and Baltimore. The best place to drive if you want cheery waves from other drivers rather than have people flipping you the bird all day long is Portland, Oregon. The study is carried out every few years and in the past Miami and New York have been the worst cities. However, this year Houston shot up from 8th place to number 1. Friendly Portland was the politest city the last time around as well. This got me wondering about how your own city would rate in terms of the politeness of the drivers there. 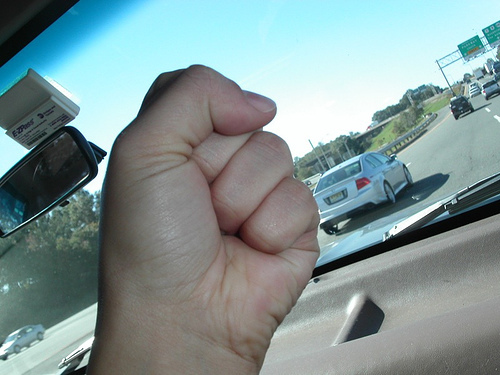 Do you regularly see examples of aggressive driving or rude behaviour while you are out driving? If you do then what do you think can be done about cracking down on it? Should there be more controls in place to catch and punish thoughtless, bad natured drivers? What Are the Most Expensive Places to Own a Car? This entry was posted in Musings, News and Views, Reports and Surveys and tagged bad drivers, road rage, road safety, survey, video by Robert Bell. Bookmark the permalink.